This is an important topic. In this discussion, I’m going to be up-front with you but I don’t mean to cause you anxiety. A lot of people will put their own health on the back burner taking care of others until something drastic occurs to them. This is human nature, I suppose. When you have diabetes however, your risk of blindness, heart attacks, strokes, kidney disease and peripheral neuropathy is too great to put it on the back burner. You need to take the situation seriously right from the start so that you can be here for your children and grand children. I told you that I was going to be frank with you. There are two types of diabetes, type 1 and type 2. Type 1 diabetes, also called juvenile onset diabetes since the onset is usually at age 29 or younger, is the least common of the two types of diabetes. Type 1 patients, however, tend to get complications inside the eye (retinopathy) more frequently and more severely than type 2 diabetics. Type 1 diabetics have some form of retinopathy in 25% of patients five years after diagnosis. This rises to 60% after 10 years and 80% after 15 years of diagnosis. Type 2 diabetes, also called adult onset diabetes since the onset is usually at age 30 or above, tends to less severe retinopathy than type 1 diabetes. Type 2 diabetics taking insulin have some form of retinopathy in 40% of patients five years after being diagnosed with diabetes. This rises to 84% nineteen years after diagnosis. Type 2 diabetics not taking insulin have some form of retinopathy in 24% of patients five years after diagnosis. This rises to 53% nineteen years after diagnosis. Type 2 diabetics typically have had diabetes for a number of years before being diagnosed with diabetes. This accounts for the closeness of the above numbers between type 1 and type 2 diabetes even though type 1 diabetics tend to get retinopathy more frequently and severely than type 1 diabetics. Clearly, the longer you have diabetes, the higher your risk is for developing retinopathy. A major study (the DCCT study, New England Journal of Medicine, 1993, vol. 329, pages 977-986.) showed, for the first time, that after 5 years of tight blood sugar control, the chances of you getting retinopathy or of your retinopathy getting worse was reduced significantly in the tight control of blood sugar group. The DCCT study also showed that after five years of tight blood sugar control, your chances of heart attacks, strokes, kidney disease and peripheral neuropathy were also significantly reduced.You cannot control how long you have diabetes, but you can control your blood sugars. The results of the DCCT study have encouraged most diabetes doctors to recommend tight blood sugar control for all of their diabetes patients. I try to tell all of my diabetic patients about this landmark study so that they will know how lifestyle choices (weight loss, diet and exercise) can significantly affect your lifespan and your quality of life. The two complications of tight blood sugar control in the DCCT study were worsening retinopathy for the first 1-2 years (more than offset by the gains of the last three years) and more hypoglycemic episode. Diabetes causes the supporting cells of the blood vessels in the retina and in other areas of the body, to die. As a result, the walls of the arteries and veins inside the eye bulge outward from blood pressure and start to leak blood into the retina. If this leakage gets close to the fovea, which is responsible for our fine vision, the swelling from the leakage can reduce your vision significantly and permanently . In order to reduce the chances of this happening, ophthalmologists do a light laser treatment on the swollen and leaking areas to try and dry it up. This laser treatment is called a focal macular laser or FML. This is an in-office procedure and is usually done after an in-the-arm dye test called an IVFA has been performed. While an FML is a low risk procedure, you need to keep your gaze straight ahead while it is being performed. If you look at the laser as the ophthalmologist activates the laser, you could permanently reduce your vision. Fortunately, this has not happened to me in over 150 FML’s that I have personally performed. After the procedure, you will need someone to drive you home. It can take up to 3-4 months for the drying up effects of the FML to be realized and sometimes an FML needs to be repeated. The ETDRS (Ophthalmology, 1991, vol. 98, pages 766-785) is the study that established the criterion and standards for FML procedure. We currently use less laser power for an FML than what is described in this study. Recent results from the use of Avastin in the treatment of retinopathy from diabetes as well as vein occlusions have supported the intra-ocular use of this drug before laser treatments in some patients. 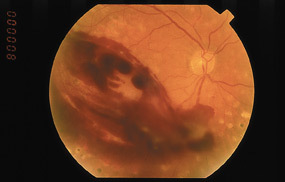 As diabetes progresses, some of the blood vessels may become blocked off completely, forming areas of retinal ischemia (which is the scientific term for dead retinal areas due to a lack of blood flow) and loss of vision through this ischemia, bleeding, a detached retina or a rare form of glaucoma. If enough of these areas occur, the retina grows new blood vessels in order to prevent itself from dying off completely. The problem is that these new blood vessels (called neovascularization which also occurs in wet ARMD) break and bleed very easily inside the eye. If they break open, you can bleed a lot inside the eye, causing you to feel that you are looking through ketchup. Over the months it takes for this blood to get reabsorbed, traction between the retina and vitreous forms which can result in a detached retina forming from which you will go blind. This sequence of events, from mild leakage and bleeding to major bleeding to blindness is well established. The pace of these changes will vary from person to person. In some people, these changes happen quickly and in other people, the retinas never progress to neovascularization (new blood vessel growth). The only thing that you can do to alter the pace of this sequence of events is tight control over your blood sugars. If we can catch the neovascularization in time, we do another type of laser treatment that destroys the peripheral retina, decreasing the retina’s demand for oxygen while preserving the central retinal areas and central vision. This causes the new blood vessels to shrink and disappear, reducing the chances of them ever bleeding. We save some of the peripheral retina so that in most people, their side vision is usually not noticeably affected. This laser is called pan retinal photocoagulation (PRP). PRP works very well. The key to the effectiveness of both laser treatments, FML and PRP, is timely intervention. All diabetics need to visit their ophthalmologist at least once a year. If you do not visit your ophthalmologist at least once a year, permanent damage may occur that we cannot help with lasers. A major retinal surgery may be needed to treat a detached retina, but even this will probably not bring back much of the lost vision. Besides tight blood sugar control, the only other factor that you can control is how often you visit your ophthalmologist. Remember, you should visit once a year, more often if asked to. Early interventions by ophthalmologists, tight blood sugar control formlifestyle choices are the only things that you can control to reduce your chance of blindness from diabetes. The AAO states that women that are not diabetic before pregnancy and develop gestational diabetes do not need an eye exam during pregnancy. My concern with this recommendation is with the small percentage of woman who have undiagnosed diabetes before pregnancy. I prefer to examine all gestational diabetic patients no matter their diabetic status before pregnancy. For known diabetic women who plan on getting pregnant, an eye exam before pregnancy and during the first trimester is warranted. 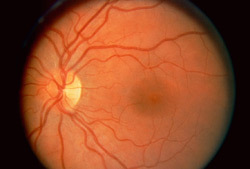 Future follow ups are determined by the status of the retinopathy seen. This web site has taken most of its information from the American Academy of Ophthalmology’s Preferred Practice Patterns publications. Each person’s medical condition is unique and all information should be reviewed with their ophthalmologist before deciding on any course of action. We cannot be held responsible for any use, misuse or outcomes from the information contained herein. Thank you.